How to sell HDB buy Condo safely? It is always difficult to move house considering the amount of complexity with so many new home loan financing rules, additional buyer stamp duties (ABSD), taxes and remissions, etc. Buying a property is stressful especially if you are switching from HDB to Private Condominium. This is because the timing of purchase and sale is of critical importance, one wrong move could lead to a cash crunch. If your cash is limited, then you will need to time your purchase property to dispose of your HDB while timing the purchase of your condominium. If you buy a Private Condominium before you sell your HDB, you could end up having to pay Additional Buyer Stamp Duty (ABSD) of 7%. This is because when you buy a condominium, the time coincides with the fact that you still owned a HDB flat. This could seriously get you in trouble if you have not prepared for extra funds for ABSD. Should I Sell HDB Buy Condo? Selling your HDB flat takes time. Not all HDB flats are easy to sell, some are hot cakes and some takes time. If you are not sure if your HDB flat is in demand or not, you could check with an agent on our panel to find out. We will get them to tell you the blunt truth so you do not get rosy scenarios and hopes. If you take 3 months to sell and another 3 to 4 months to transact, then this will potentially take you 6 months. By that time, you would have lost your preferred property. 6 to 8 weeks later – 2nd Appointment – “Resale completion appointment”. Receipt of all monies and completion of transaction. The waiting time required for appointments depends on the prevailing queue and scheduling at HDB. What the Pros and Cons of Selling HDB flat first and buying Private Condominium later? Cash flow is clear and not in doubt. Selling HDB flat takes time. HDB Transaction takes 3 to 4 months. Missing out on your preferred choice of house/bargain. You will have no place to stay after selling your HDB flat. 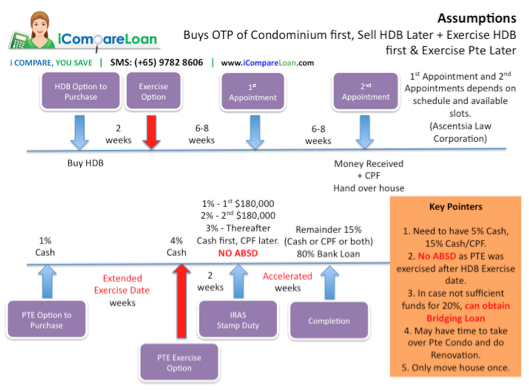 Info-graphic 1 shows the time-frame of Selling HDB Flat and Buying Private Condominium. Are there any benefits to Sell HDB buy Condo? Assuming that both HDB and PTE Condominium falls at the same rate. A HDB that is $500,000 that has fallen by 20% is $400,000, while a condominium that is $1,000,000 that has fallen by 20% is $800,000. The quantum is different. You may have lost $100,000 of value for your HDB, but you are buying PTE Condominium for $200,000 cheaper. The absolute price quantum also comes within your affordability range, this presents an opportunity to upgrade to a Condominium for lifestyle reasons. If HDB flat and Private Condominium both recovers 25%, you will have made $100,000 more in equity compared to owning at HDB flat. Just like you lose a bet for $10 and won a bet for $20, your win/loss ratio is still 50%, but you made $10. But the reverse could also be true. Should I Buy a Condominium First before Selling my HDB Flat? Many times the right facing, the right price comes only once. It could be that some people wanting to offload their property quickly as they want to emigrate and need the money to buy a house overseas, it could be due to a divorce settlement or it could be an ancestral home where they want to sell to split their inheritance or this person simply needs the money for his business and the offer is just too good to refuse. What are the Pros and Cons of Buying a Private Condominium and Selling HDB flat later? You get a good deal that can potentially save you hundreds of thousands of dollars. You get the right facing and right feng shui. You have a place to move into and have it niecly renovated and done up before moving out of your HDB flat. You need a lot of cash for this. Some people may have a cash shortfall if they have not yet disposed of their HDB flat. Incur Additional buyer stamp duty (ABSD) for 7% for Singapore Citizens buying 2nd residential property. 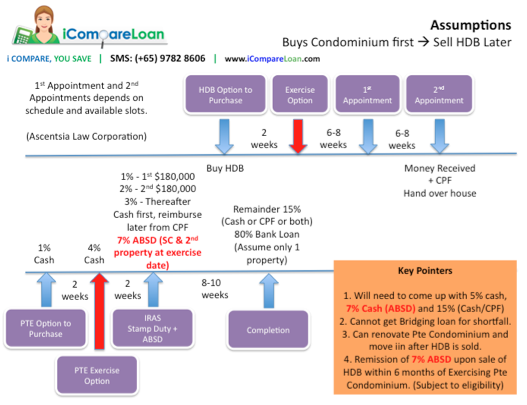 Time Line for Buying Condominium first and sell HDB later. 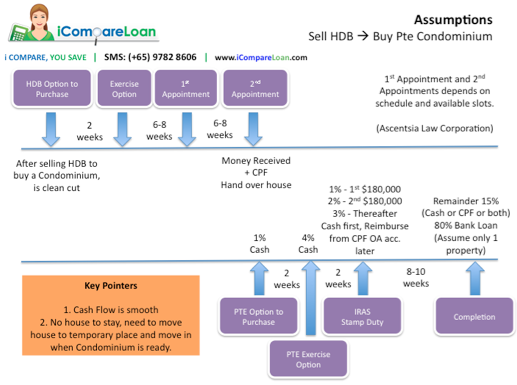 The info-graphic 2 shows you the time-line for buying a condominium first and selling a HDB flat later. How do I get the Best of Both Worlds to Buy Condo and Sell HDB flat later without Incurring ABSD? I want to catch a good deal condominium with my preferred facing. I want a condominium fully renovated. I do not want to move house 2 times. I want to have sufficient cash for the downpayment. To fulfill the above, it needs a bit of a manoeuvre. You need a good property agent to assist you to source for a private condominium while at the same time put your HDB flat up into the market. A good property agent will be able to estimate how long it will take to sell the HDB flat while standing by the Private Condominium choices and options. Before you place any option to purchase deposit of 1%, do make sure that you have your home loan ready, check with an experienced mortgage broker who can help you work through the entire process. You buy the Condominium by placing a deposit, it is called an Option to purchase (OTP) of 1%. You can structure your OTP’s exercise date much later, our expert agents and lawyers can assist. At the same time, you quickly sell your HDB flat. Remember, your HDB flat must exercise option before your Condominium’s exercise date to qualify for NO Additional Buyer Stamp Duty (ABSD) as the ABSD is measured based on the exercise date, not the option-to-purchase date. At the point of your exercising your Private Condominium Option-to-purchase (OTP) you do not own a residential property, you have already “Sold” as the buyer of your HDB flat exercised option on your HDB flat. Then you will still need to be able to pay 1% OTP plus 4% exercise option, plus stamp duty of roughly 3%. Upon completion of the private condominium purchase, you will still need to pay 15% in either Cash or CPF or Cash/CPF. If you have a shortfall of this funds, you can arrange a housing bridging loan from the sale of your HDB flat for this purpose, subject to your HDB flat having sufficient equity and bank’s internal guideline. iCompareLoan’s team of mortgage brokers have handled very complicated cases and can assist you to work through many property purchase situations or sell and buy situations by pairing up with carefully shortlisted top property agents who understand the process and time-lines. Sell hdb buy condo or the reverse, they are the same, ultimately you will end up with a nice condominium and you will eventually sell off your HDB flat, do what fits your financial circumstances. There is no fee to pay us as we receive a standard fee from the banks (if home loans are completed through us) and no need to pay a Buyer Property agent. What have you got to lose?